The forestry sector is among the top ten manufacturing employers in 48 US. Logging has also been among the top three most dangerous occupations for decade. 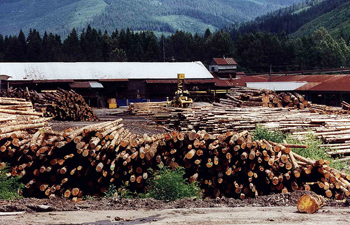 Logging involves exposures to a wide variety of hazards, including: work in close proximity to heavy equipment and trucks; tree falls, log movements and falling objects; ergonomic issues; hand-arm and whole-body vibration; noise, and; environmental factors. The fatality rate for loggers is 133 deaths per 100,000 workers, the highest rate in 2015 and substantially greater than the overall US rate of 3.4 per 100,000. Washington and Oregon represent about 20% of total US logging employment. Logging is characterized by small businesses, comprising only 0.5% of all US employment, but accounts for 2% of all workplace fatalities. Smaller logging contractors have mortality risks ten times higher than larger firms. Injuries are also very common in logging. The rate of workers’ compensation claims in Oregon is 4.5-7.0 per 100 logging workers, much higher than the state average of 1.2-1. In coming years the logging sector will emerge from the recession with a workforce substantially reduced in numbers and skills. Increased mechanization of logging is changing the nature of the hazards and is generally safety, yet these new technologies introduce new hazards to address. There is a need to build this valuable worforce’s skills and knowledge to improve their safety. Our forestry and logging research priorities are developed on participation with stakeholders. See the National Occupational Research Agenda for Agriculture, Forestry, and Fishing. Synthetic Rope For Logging Rigging is replacing wire rope. It is as strong as steel wire rope, it is the same diameter, and it weighs about 90% less. In research trials it has demonstrated improvements to workload, strain, and fatigue. Protecting the Logging Workforce: Development of Innovative Logging Techniques for a Safety Working Environment. This three year Oregon State University study will develop guidelines for innovative logging systems using cable-assisted falling machines, prebunching of turns, and enhanced visibility for grapple logging that can eliminate or reduce the need for high risk manual activities. Also consider contacting local associations; Membership-based programs offer excellent training and insurance information and support. Also see below for additional Spanish language materials.